Pro-Russian militants carried out 25 attacks. One Ukrainian soldier was killed, one wounded and one injured in combat in Donbas on 17 November, the antiterrorist operation (ATO) HQ said in its morning update on Facebook. It said that the situation in the ATO area remains tense because Russian troops continue to blatantly violate the ceasefire and target the positions of the Ukrainian Armed Forces. In the Luhansk sector, pro-Russian militants used 120-mm and 82-mm mortars near Tryokhizbenka, mortars and grenade launchers against the ATO positions near Troyitske and Luhanske. According to the Luhansk regional state administration, two Ukrainian servicemen were wounded during the militant attacks on Troyitske. In the Donetsk sector, the militants fired with mortars of various calibres, grenade launchers and small arms against the ATO positions near Pavlopil. 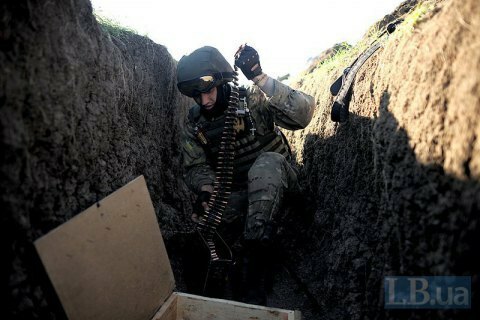 They targeted the suburbs of Avdiyivka with grenade launchers, heavy machine guns and small arms. Maryinka came under fire with heavy machine guns. The ATO HQ registered 25 attacks by pro-Russian militants.